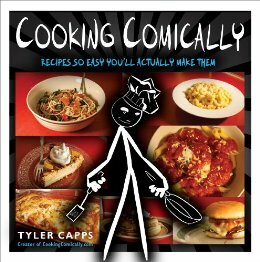 Asheville illustrator Tyler Capps has made the leap from online to on your bookshelf with Cooking Comically, his innovative new cookbook, out Oct. 1 through Penguin imprint Perigree Books. In the hours leading up to publication day and just before his Oct. 2 signing at Malaprop’s, Capps spoke about his work process and the various responses to his recipes. 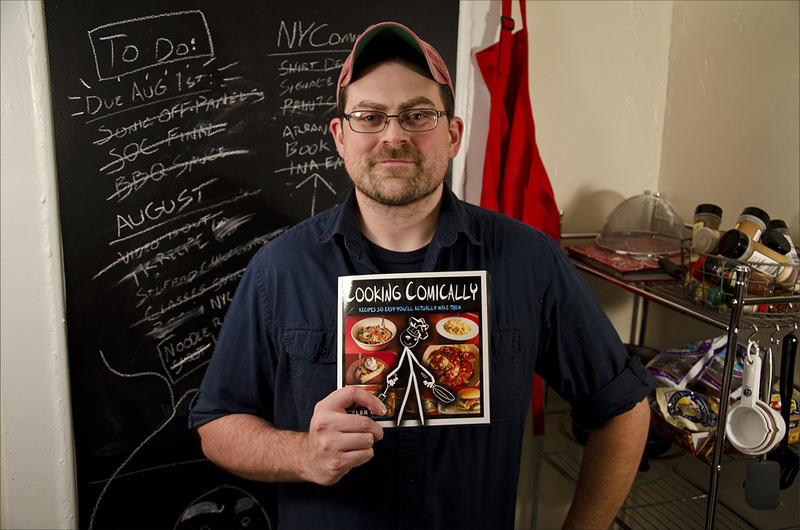 Question: Who are your go-to chefs and what are some key cookbooks in your kitchen? Answer: Alton Brown would probably be my go-to chef. I love scientific approach Good Eats takes. Key cookbooks would probably be America’s Test Kitchen and this inch-thick stack of recipes I got from my mom’s collection. I also just picked up a James Beard book on a friends recommendation and I can see that being pretty good to have. Q: What’s an example of a recipe (or recipes) that you altered and what was it about a certain step or ingredient that inspired you to put your own spin on it? A: One example could be the Peanut Butter Banana Bread. I basically took my mom’s banana bread recipe and thought to myself “That could use some peanut butter.” Because I love the PB and banana combination. Sadly, it’s often really that simple. Q: What model of camera and brand of animation software do you use and why? A: The book and all the recipes so far were shot with a Nikon D70s, but I just recently upgraded to a D7000. For drawing I use an 6″x8″ Intuos 3 and Photoshop CS5. I use all of this because it’s just what I know. I’ve been using Nikons and Photoshop for my other work for years now. Q: You recently collaborated with Thug Kitchen and have previously worked with Cooking Channel. Are any other crossovers in the works? A: No other crossovers are planned yet, but I would definitely like to work with some actual chefs on recipes in the future. As in photograph someone else going through the process of making a dish and turn that into a comic. I think that has the potential to go well. Q: How did the American Express connection come about? A: One of the people who was organizing the project actually hounded me for a good while. Ever since the site launched I’ve been getting this assortment of emails from different people offering a variety of vaguely worded “opportunities.” They almost always turned out to be awful ideas for advertising. Some people wanted to add video ads, some wanted to publish their own sponsored content on the blog and one even wanted to help me add pop up ads to the site. So I started ignoring those kinds of emails. So, when this person approached me about an “exciting opportunity” I initially just wrote it off. But, they persisted and eventually I was like “Fine! What is it?” and it turned out to be something really awesome and I felt a little dumb. Q: It looks like the shoot took place at your apartment and briefly in a local grocery store, but also worked in footage from your time abroad. What all did the filming process involve and how involved were you in the overall content? A: Most of the shoot did take place in my apartment and the grocery store was the Amazing Savings out toward Black Mountain. I didn’t have much say as far as the content went. I gave them some photos and video of things we had talked about in the interview for them to use, but beyond that they had a pretty clear idea of what they wanted. That’s not to say it’s disingenuous, though. Q: What kind of feedback have you received from the AmEx spots? Any memorable fan mail? A: I have gotten some memorable fan mail, but not really for the Amex spots. The feedback has been pretty good though. The funniest thing is that I just learned a couple days ago that they’re running as ads in front of youtube videos because a friend of mine saw a commercial with me in it and messaged me to ask what the hell was going on. Q: What kind of feedback have you received from food and comic book professionals, respectively? A: Well, professionals don’t generally write disparaging messages to people, so the overall response has been good! Honestly though, I haven’t heard much from the comic side of things. Most everyone finds me from the food blog side and generally speaking the people I’ve heard from in the food world tend to like the idea. Q: You’ll be at New York Comic Con from Oct. 10-13. What’s your schedule during those days and who are you looking forward to seeing or meeting? A: My schedule is still being worked out. I should be at the booth most of the time, but I’ll also be able to get out and see some of the convention while I’m there too. I’m really just excited to be going anywhere. I haven’t been out of the region in a few years. The fact that I’m headed to a place with tons of people who have the same interests and passions is all the better. Q: Are you working on any other major projects? And are there plans for a Cooking Comically sequel? A: I don’t have any other major projects (I don’t know how I could sustain any other projects at this point to be honest) in the works. As far as a second book goes, that depends entirely on how well this first one does. I’d love to do another, but we’ll see how it goes.